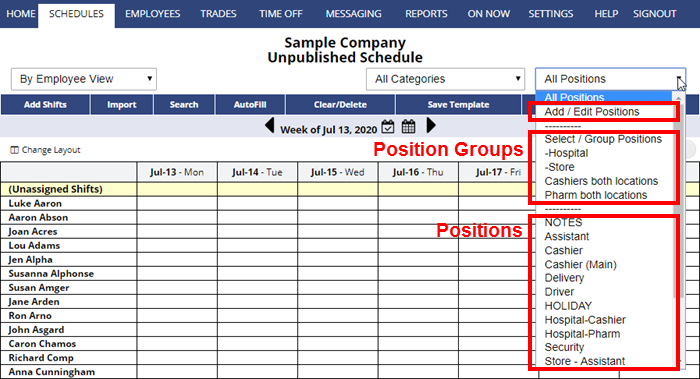 Position Groups make it easy to view groups of shifts in any manner you like. Position Groups are shortcuts to view certain groups of Positions. You can group any number of Positions and name the group for quick access later. 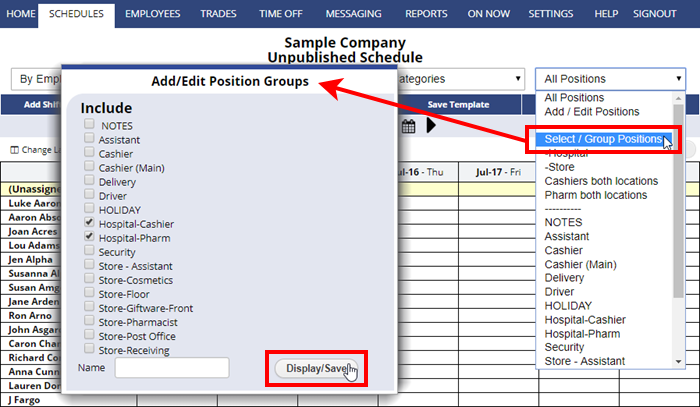 Filtering your view to show a Position Group not only limits the view/printout to show only those shifts, but also allows you to affect only those shifts when you Import, Clear/Delete shifts or Save Template. When you are done, you can choose All Positions to go back to viewing the complete schedule. Once you have created and named a Position Group, it will appear in the Positions dropdown above your regular list of Positions. Ex. if you create a number of positions that are for trainees: Cashier – Trainee, Cosmetics – Trainee, etc., you can create a group that includes all of the Trainee positions for a quick view of all Trainees that are working today. Ex. if you create location-specific positions, you can group those positions so that you can view one location at a time and perhaps also create a view that includes one position across all locations. The possibilities are endless.